Cupping is an alternative, therapeutic approach that utilizes special cups, applied to different areas of the body for a duration of 30 seconds to 5 minutes. Recently, cupping has become well known due to the 2016 Olympics in Rio De Janeiro. However, cupping dates back to ancient Chinese, Egyptian, and Middle Eastern cultures as far as 1550 B.C. Our chiropractors at ICT Muscle & Joint Clinic, utilize cupping for the treatment and rapid release of taut soft tissues, myofascial pain, inflammation, blood flow, and improved joint range of motion. Our approach to cupping is more modern than a traditional approach. We utilize silicone, vacuum-based cups instead of the traditional glass, heating method. Cupping works by creating a “negative” tension on myofascial areas of the body. Instead of applying pressure into the body, commonly associated with a vast amount of soft tissue therapies, cupping draws the pressure away from the problematic area by pulling on the muscles and fascia. Cupping will often leave non-painful, circular, bruise-like marks on the skin after application. The discoloration varies depending on: the duration of cupping, pressure generated in the cup, and the level of stagnation within the deeper tissue layers. Discolored marks can vary from dark purple to bright red, and may last anywhere from a few hours to 1-2 weeks. Areas with more discoloration may take several visits to subside. 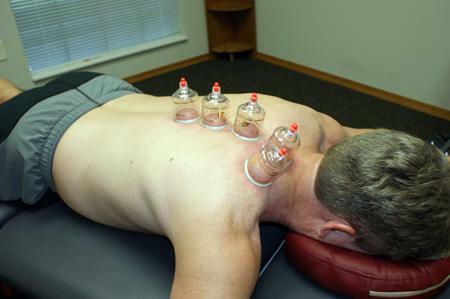 Cupping is a fantastic and effective soft tissue technique when other forms of soft tissue therapies and strategies do not produce wanted results.